Let us not fool ourselves with the notion that the horrendous abuse inflicted on innocents in industrial schools and suchlike institutions is a post-conciliar phenomenon. Grave sin is a feature of fallen human nature generally, not of post-conciliar theology alone. There is a tendency among some Traditional Catholics to imagine that, because we have access to the old Latin Mass, we are somehow immune from such turpitude. The Ryan Report, as well as more recent experience, should be sufficient to disabuse us of that precious notion. 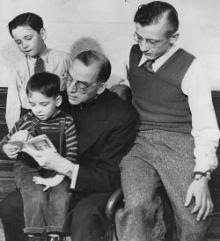 Alarm bells were sounded as long ago as the 1940s — long before the Novus Ordo was imposed on these shores — by no less a figure than Father Edward Flanagan, of “Boys’ Town” fame, who in 1946 condemned Ireland’s reform schools as “a disgrace to the nation”. It is much to be regretted that his judgement went unheeded. If a thoroughgoing reform of these institutions had been undertaken and pursued by ecclesiastical authorities at the time, how much suffering and abuse might have been averted, how much scandal need never have been given! But, alas, Fr. Flanagan’s timely warnings were not only ignored; he was attacked and ridiculed for daring to upset the status quo. This story courtesy of Irish Central. Melancholicus has added his own remarks in red. H/T to Dennis K. for the link. Father Edward Flanagan, founder of "Boys Town" made famous by the Spencer Tracy movie, was a lone voice in condemning Ireland's industrial schools back in the 1940s –and he was viciously castigated by church and government for doing so. Fr. Flanagan, from Co. Roscommon, left Ireland in 1904 and was ordained a priest eight years later. In 1917 he was living and working in Omaha, Nebraska, when he hit upon the idea of a "boys town," which offered education and a home for the poor and wayward boys of Omaha. However, demand for the service was so great that he soon had to find bigger premises. Boys Town, built on a farm 10 miles from Omaha, was the result. Boys Town eventually became so well-known - and so well-respected - that Hollywood and the U.S. President came calling. Spencer Tracey and Mickey Rooney starred in the 1938 movie "Boys Town," and it made a national hero out of Fr. Flanagan [Let your light so shine before men, that they may see your good works and glorify your Father in heaven - Mt. 5:16]. He was internationally renowned as “the world's most foremost expert on boys' training and youth care." When World War II ended in 1945, President Harry S. Truman asked Fr. Flanagan to tour Asia and Europe, to see what could be done for the homeless and neglected children in those regions. Fr. Flanagan decided to return to the land of his birth in 1946 to visit his family, and also to visit the "so-called training schools" run by the Christian Brothers to see if they were "a success or failure" [Fr. Flanagan thus approached these institutions with an open mind]. But Fr. Flanagan was unhappy with what he found in Ireland. He was dismayed at the state of Ireland's reform schools and blasted them as "a scandal, un-Christlike, and wrong." [that's very strong language for 1946. Fr. Flanagan was clearly disturbed by what he found] And he said the Christian Brothers, founded by Edmund Rice, had lost its way [a telling remark, the truth of which has since been borne out times without number]. Fr. Flanagan was a devout Catholic, a man who Catholics and non-Catholics world-wide had deemed a hero. He was the Mother Theresa of his day. Despite that, the Irish Church and the Irish authorities felt comfortable ignoring Fr. Flanagan, ignoring the fact that he was considered to be an expert in the matter of providing for the education and upbringing of boys who were otherwise considered to be "lost causes." Again, his efforts fell on stony ground. What was it about the Irish Church and the Irish authorities that made them so insular that they felt comfortable dismissing someone of Fr. Flanagan's stature? Despite the fact that Fr. Flanagan was a popular hero to many Irish people, his words had no sway with those in authority, whether in the government or the Church [they may now rue that they did not listen. But it is now too late for such regrets - the damage has been done, and what unspeakable damage it is!]. And, once those who endorsed the industrial school model survived Fr. Flanagan's broadsides, they must have known that no one would challenge them again. They were right, for 50 years anyway [they could get away with it for a time, only for a time; the truth will always come out in the end]. Not since the penal times has the Catholic Church been so threatened in Ireland. Only this time the damage is all self-inflicted and not imposed by an outside force. Unless strong Catholic characters arise from the wreckage we have now, the Church in Ireland is doomed [unless we are as blind and obtuse as the late Minister Boland, we must concur with the writer's assessment]. Indeed. Is the Church in Ireland built upon rock or upon sand? In the light of the number of millstones—far too many millstones!—we might perforce conclude the latter. But such an institution surely deserves to wither. Without heroic penitence and true charity there is no hope for it, not now, not ever.